Dove Mountain has a wonderful variety of upscale restaurants ranging from Classic Italian to down-to-earth steakhouses. We’ve rounded up the best Dove Mountain restaurants in this article for you. So the next time you want to explore restaurants in the area, you’ll know just where to go. This Dove Mountain restaurant features Authentic Neapolitan Pizza, wonderful fresh salads with homemade dressings, pastas with delicious sauces and Paninis with the bread made fresh to order. It has outdoor seating, casual ambience, full bar, and is a great spot for dinner. Prices typically range from $11-30. This down-to-earth steakhouse is NOT like Sullivans or Ruth Chris Steakhouse. It offers the same high quality meats prepared to perfection, but the ambiance is more casual. It has a classic southwestern style where you’ll feel more comfortable sporting your cowboy boots and jeans than your suit and tie. It has outdoor seating, full bar, and prices typically range from $31-60. If it’s true American Cuisine you crave, head to Core Kitchen and Wine Bar, located in the beautiful Ritz-Carlton, Dove Mountain resort. This stunning new restaurant features six dining venues and a menu focused on regional sustainable cuisine and local growers. Cayton’s is one of the six dining venues in CORE kitchen and wine bar. It is located in the clubhouse and is open daily from 11am to 6pm, and open til 8:30 pm on Thursdays through Saturdays. Cayton’s is a casual, upscale spot that is great for kids and groups and features a full bar. 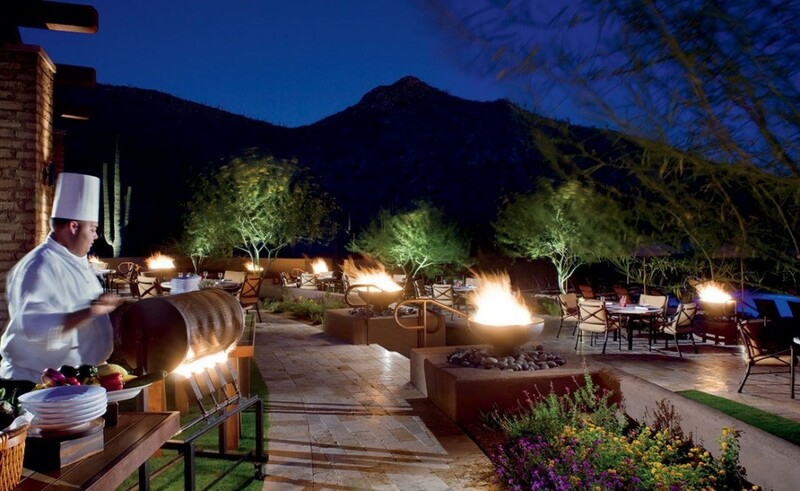 You can sit outside by the firepits and enjoy spectacular Dove Mountain sunsets. So there you have it, a quick roundup of the top restaurants in and around Dove Mountain, Arizona.